The online jeweler was tripped up by challenging economic conditions around the globe, says CEO Harvey Kanter, but it's moving ahead with plans to open more physical "webrooms." A challenging holiday season wiped away some of the luster on online jeweler Blue Nile's (NILE otherwise solid year. Blue Nile shares plunged roughly 23% on Feb. 11 as fourth quarter revenue fell 4.8% from the prior year to $150 million, missing Wall Street forecasts for $163.9 million. Adjusted for one-time items, earnings came in at 43 cents a share, narrowly surpassing estimates by a penny. With turbulent stock markets around the world zapping the wealth of the rich, Blue Nile saw tepid demand for higher end jewelry priced north of $25,000. Further, with diamond prices reaching a five-year low in late January, consumers were able to buy more diamonds from Blue Nile at lower prices, which weighed on revenue. Blue Nile's U.S. engagement business, which comprises about 56% of the total company, saw its sales decrease 7.7% year over year to $78.4 million during the fourth quarter. Meantime, sales of non-engagement jewelry in the U.S. -- such as fashion necklaces and earrings that make up 27% of Blue Nile's business -- experienced a 0.3% sales decline to $48.7 million. Excluding the negative impact of the strong U.S. dollar, sales internationally managed to increase 5.4%. For the year, Blue Nile's sales rose 1.4% to $480.3 million while operating profits gained 13.3% to $16.1 million. "We believe the market doesn't like the revenue [from us], appreciates the margin improvement, but needs to see both [improve] -- the market right now has enough volatility in it that any miss on some perceived material element is a cause for concern, right or wrong," Blue Nile chairman, president and CEO Harvey Kanter told TheStreet. Kanter added, "I just think there is a concern out there [on the economy], and folks at some levels are not buying the stones that are $200,000, $300,000, $400,000, and in some cases a million dollars in value -- they are taking a time out, which we have seen that unfortunately for the better part of the past year and while we expected it to stabilize in the fourth quarter, it was actually worse." 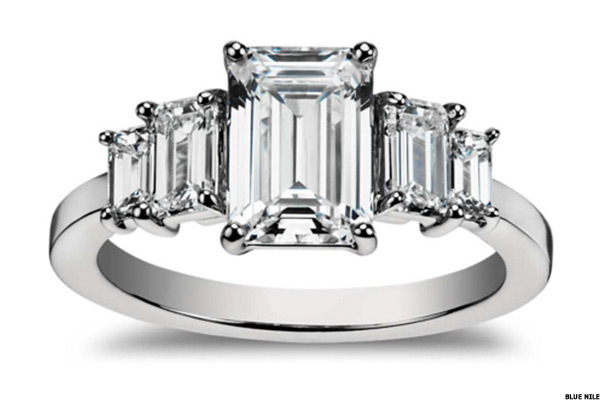 Blue Nile sold a record number of engagement rings for the holidays. Not everything was tarnished for Blue Nile during the holidays. The company's U.S. engagement ring business saw a record level of unit sales, and notched the best growth rate since 2012, said Blue Nile. The company's wedding band business delivered double-digit unit growth for the holidays. 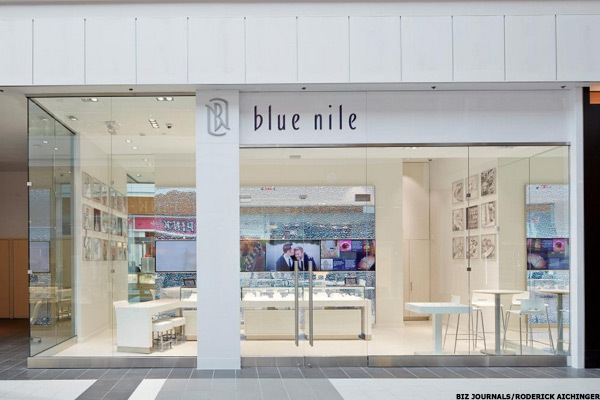 Unfortunately, Blue Nile's success in moving units was overshadowed by the lower prices for diamond jewelry and more price competition for cheaper fashion jewelry, which caused revenue to decline. "While lower diamond prices have historically been a tailwind for Blue Nile, consumers are currently pocketing some of the savings rather than fully trading up, which is driving lower average selling prices -- this is a worrisome trend as it is a consumer dynamic not seen by Blue Nile since 2008," said Wells Fargo senior analyst Matt Nemer in a Feb. 12 note to clients. Nemer, who rates Blue Nile at market perform continued, "While we're encouraged by the solid unit growth in engagement sales, the success of the company's new physical store strategy, and the special dividend announced, we remain on the sidelines given the uncertainty around the current macro environment." Blue Nile is the latest jeweler to report a disappointing holiday season from the U.S in what was a challenging year for the industry overall. High-end jeweler Tiffany & Co. (TIF - Get Report) warned on Jan. 19 that same-store sales in its Americas division -- which includes about 100 retail stores -- fell 8% in the fourth quarter when excluding the negative impact of the stronger U.S. dollar. The company blamed lower foreign tourist spending in New York City where it operates several prominent flagships such as on 5th Avenue and Wall Street, as well as weak demand in other key U.S. markets. Charm bracelet maker Pandora saw its shares dive about 7.3% on Feb. 9 following a revenue growth outlook for this year that might be half the pace of 2015 -- adding insult to injury, the company also missed Wall Street's fourth quarter profit projections. According to the U.S. Commerce Department, total sales of fine jewelry and fine watches in the U.S. last year tallied about $75.4 billion, a modest improvement from $74.7 billion in 2014. Weak diamond prices take their toll on the jewelry industry. Outside of the U.S., Blue Nile's business was a bit more mixed. When stripping out the influence of the strong dollar, Blue Nile's sales in Europe grew by more than 25% in the fourth quarter. In China, which is experiencing its own economic slowdown, Blue Nile's sales increased about 5% compared to being unchanged in the third quarter. But excluding a large $1.8 million sale booked in China in the third quarter of 2014, sales increased 30% year-over-year -- meaning the fourth quarter marked a sharp, sequential sales slowdown for Blue Nile that is indicative of the country's rising macroeconomic pressures. Said Kanter, "The overall reported economic growth rate in China has slowed, the Shanghai stock market where a lot of people got involved personally is not working in the favor of discretionary spending -- there are elements on a macroeconomic level that are just not working." "We still believe in China," said Kanter. For 2016, Blue Nile forecast net sales in a range of $465 million to $495 million compared to $480 million a year ago. Earnings are seen in a range of 88 cents to 95 cents a share versus 90 cents a share in 2015. Despite the setback in the fourth quarter and the stock market's harsh response, Blue Nile is moving forward with several initiatives. Blue Nile sees the potential for 25-50 "webrooms" over time. The retailer will open its second "webroom" in Westchester Mall in White Plains, NY by early summer, and is finalizing leases for three other physical locations that will debut this year, too. 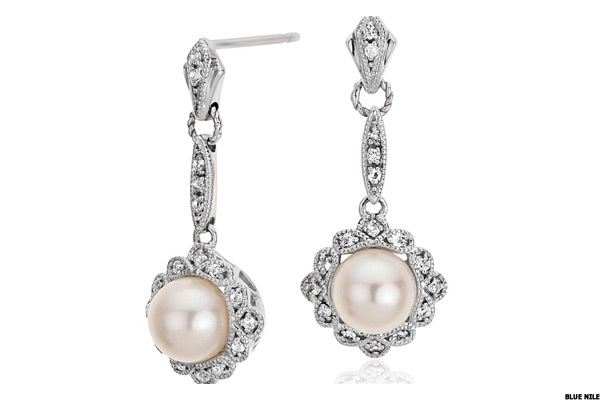 Blue Nile opened its first webroom in June last year at Roosevelt Field Mall in Garden City, NY. The webrooms -- as pictured above -- are retail stores where consumers can sit with an employee and choose their jewelry from tablet devices. There is no physical inventory in the store, which minimizes operating costs and allows Blue Nile to pass the savings on to shoppers. Following a successful response at the initial Roosevelt Field spot -- indicated by the webroom helping to lift sales in the area outside of the mall -- the company is expanding the concept more aggressively. Meanwhile, the company also announced its first-ever dividend, enacting a special cash dividend equal to $0.70 a share that will be payable on March 7 to shareholders of record at the close of business on February 22. Added Kanter, "We feel really great about the profitability of the business and the underlying fundamental business results we brought to the plate [in the fourth quarter]." If stock markets around the globe stabilize, investors may start feeling similarly.